Once you purchase an add-on or a bundle from wprssaggregator.com, a few things will happen. This same Purchase Receipt is sent by email to the email address used during checkout on the wprssaggregator.com website (not your PayPal or 2Checkout email address, unless they are the same). You will have an account automatically created for you on wprssaggregator.com. You will be sent an email to create a new password for this account. The username will always be the email address used at checkout (the same one used in 2 above). Within this account, you will be able to do everything from view your purchase history to manage your licenses and subscriptions. Click here to learn more about your WP RSS Aggregator account. Once your purchase has gone through and you received the above emails, it's time to install the add-ons on your WordPress site. You can download your premium add-ons at any time throughout the lifetime of your license. 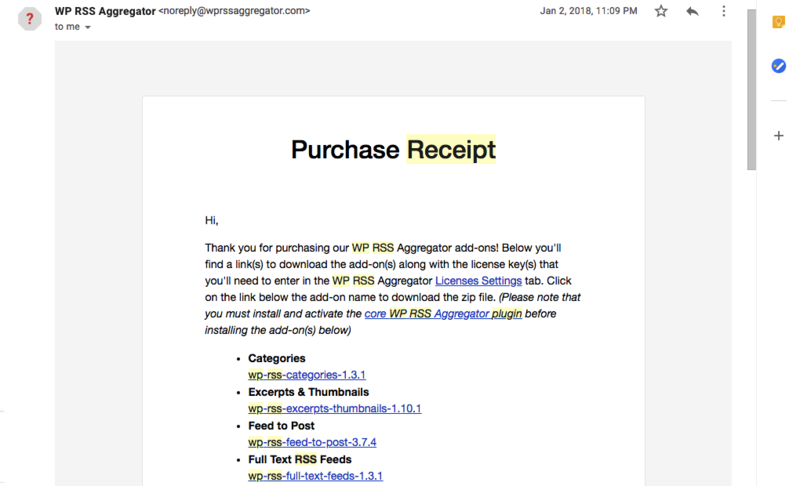 You can do this either through the Purchase Receipt or from your WP RSS Aggregator account. Scroll down to the Products section and click on the add-on's zip file that has a download link. The add-on will now be downloaded as a zip file to your computer. Visit the License Keys tab and click on the View your Purchase Receipt link in the Details column of the add-on that you want to download. REQUIRED: All WP RSS Aggregator add-ons require the free core version of WP RSS Aggregator to be installed and activated. Installing any of our premium add-ons will always follow the same steps explained in the video and list below. Click on the Add New button at the top of the page, near the "Plugins" header. Now click on the Upload Plugin button at the top of the page, near the "Plugins" header. Locate and choose the zip file of the add-on that you just downloaded. Congratulations, your add-on is installed and ready to use! To learn more about what each add-on will add to your site, please click here and find the add-on you need. Next, locate the add-on folder you extracted on your computer.